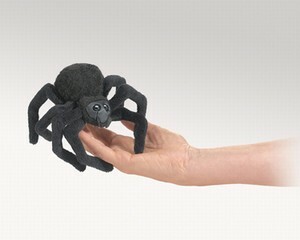 Folkmanis 2754 - Arachnophobes won't mind the whimsical Mini Spider finger puppet. Featured in all black this not so scary creature has gangly long legs, a bulbous abdomen, and fangs on a leatherette face with big beady eyes. Finger puppet. Puppet measures 5” x 5” x2”.